Earlier this month, Boston artist Sarah B. Peck created In Residence at Mobius, an interactive, conversation-based performance work. Upon entering the space, I experienced a warm, inviting ambience. The artist was seated on the floor, on her grandfather’s rug, beside his hand-hewn wooden bench and lamp, illuminating an assortment of colored threads and a basket with knitting needles. She was flanked on either side by an impressive array of commercially-made juice bottles – collected over a three-year period – arranged on low-lying tables covered in sand, each containing a snippet of text on paper. As visitors entered the space, Sarah invited them to choose a bottle, sit with her, and share a story. The texts, she explained, were chosen from her parents’ favorite love songs. Most of those who chose a bottle did so on the basis of the text contained within. I was drawn to a bottle with these words: the one that makes. I’d been thinking about the artist Ann Hamilton, having recently listened to the podcast of a live interview, Making and the Spaces We Share, by radio host and writer Krista Tippett. For years I’ve followed the work of Hamilton, a self-described maker. A recipient of the MacArthur Fellowship and professor of art at Ohio State University, she creates visionary installations that engage and surround the senses in monumental yet intimate ways, confronting us with our humanity. From the early days of Hamilton’s practice as a weaver and throughout her evolution as an artist, she’s maintained a connection to the nature and materiality of text and textiles – that for her are eternally woven. As I took my place on the pillows next to Sarah, she directed me to select two colors of thread. I chose red (for me) and ecru (for Sarah). We embarked on a conversation about our mutual admiration for Ann Hamilton and the nature of making in general (we admitted that few activities gave us as much pleasure). 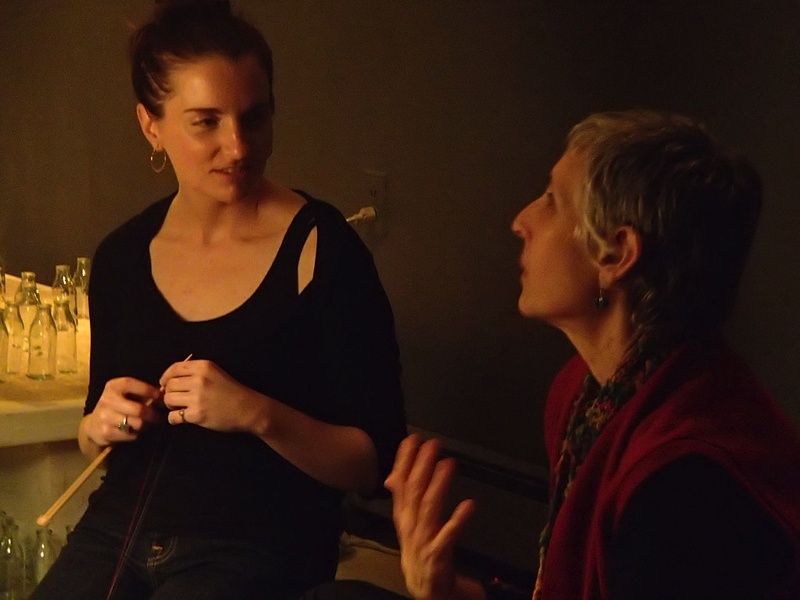 As we talked, Sarah pulled the two threads up and around a knitting needle, winding the threads around and around for the duration of our exchange. Throughout, I was cognizant of the space that Sarah had created for the telling and hearing of stories, gathering people in our cozy venue and offering the experience of personal, witnessed encounters. I kept returning to the radio interview, where Hamilton was quoted as saying, “The tactile experience of words and the tactile experience of things is a space we are always straddling.” Recalling memories of sitting on the couch close to her grandmother, being read to as she found the rhythm of her hands being busy (knitting, crocheting, needlepoint), she describes a phenomenon she experiences as “the body falling open” as the material is accreting in her hands, and the voice of her grandmother “unfolds in space”. There was Sarah, twirling her fingers, pulling up the threads as we exchanged words. When our conversation reached its natural conclusion, she picked up a scissor and cut the red and ecru threads from their spools and maneuvered the bound threads off the knitting needle and into my juice bottle. And there it was: a full measure and artifact of our exchange, a worm-like form of duo-colored threads joined with the textual fragment of a love song. I’d be remiss not to mention that as a life-long maker, I’m greatly inspired by the proliferation of makerspaces worldwide that allow people to make in a social, collective and democratic sphere. The sharing of space, tools, resources, education and technology in the makerspace environment is, to my mind, one of the most positive movements happening today. I encourage you to check them out. Makers of the world unite! This entry was posted in Posts and tagged Ann Hamilton, Krista Tippett, maker, makerspace, Mobius, On Being, Sarah B. Peck on March 26, 2014 by Catherine Tutter.